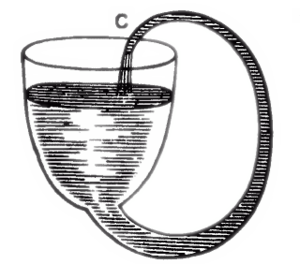 Robert Boyle's self-flowing flask appears to fill itself through siphon action. This is not possible in reality because a siphon requires its "output" to be lower than the "input". A perpetual motion machine is a hypothetical isolated system capable of having internal motion indefinitely. Many attempts to build such a system have failed for a simple reason: entropy (disorder) is always increasing, and a perpetual motion machine would defy that law. A perpetual motion machine would try to use its initial energy to remain in motion perpetually. Because entropy is always increasing isolated systems, indefinite motion is impossible because an increase in the disorder of the system will inevitably disrupt the motion and require additional energy to "fix" it. The Second Law of Thermodynamics predicts that a perpetual motion machine in this sense is impossible, and none has ever been created. An even less plausible type of perpetual motion machine would continue to perform work without any input of energy, thereby serving as an unlimited energy source. This is prohibited by the First Law of Thermodynamics, which states that energy must be conserved. Since both types of perpetual motion machine are flawed in both theory and in practice, they are clearly pseudoscience. Despite this, websites have professed to offer "free energy" devices for sale. The rejection of the possibility of a perpetual motion machine requires recognition that the Earth itself is not in perpetual motion, and that its instability is increasing, which is one of the many Counterexamples to an Old Earth. This page was last modified on 7 September 2016, at 14:19.